Use tags and searches to quickly find what you need. 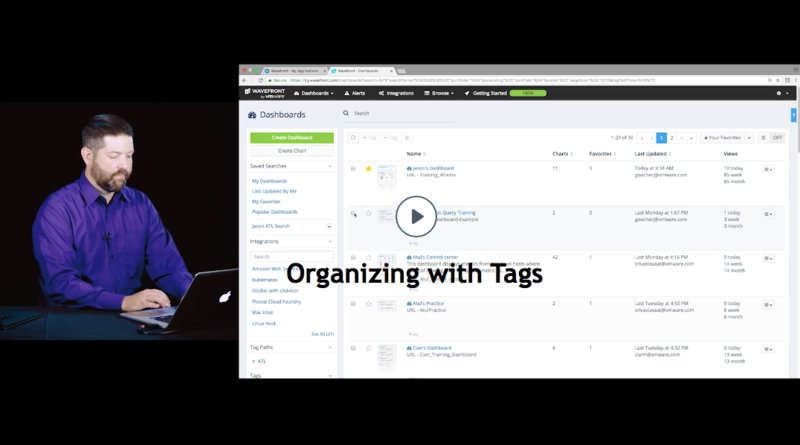 Jason’s videos show how you use tags and searches in the UI to find what you need. 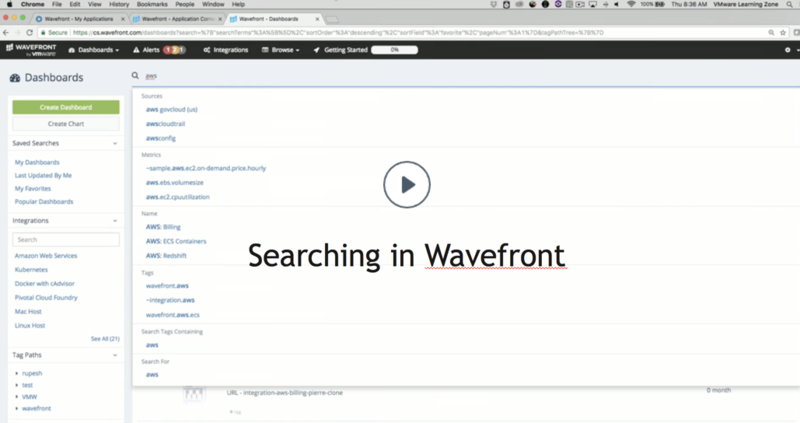 Clement’s video explains how to use tagging in Wavefront. Jason starts with a search on the dashboard page where he applies functions and filters. Then he saves a search for later use and shares the saved search. Jason demos navigation. 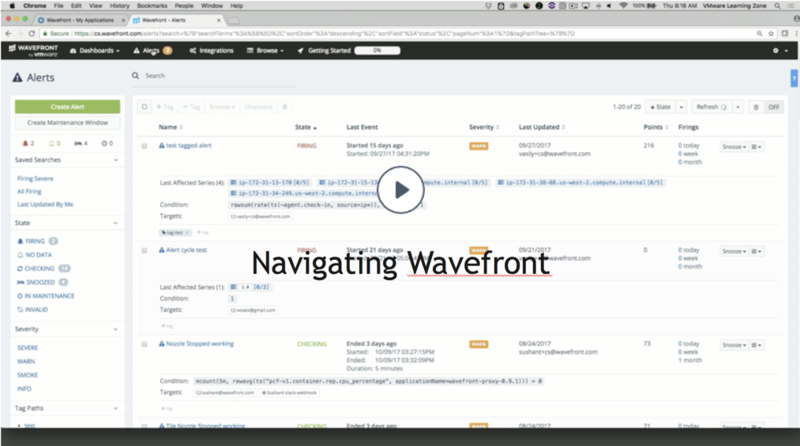 The Wavefront UI makes it easy to find what you needin the Dashboard browser, Alerts browser, Metrics browser, Sources browser, and Traces browser. In each browser, you drill down and you can organize and filter with tags, shown in the next video. Tags make it easy to organize information. Jason shows an example of assigning a tag (e.g. 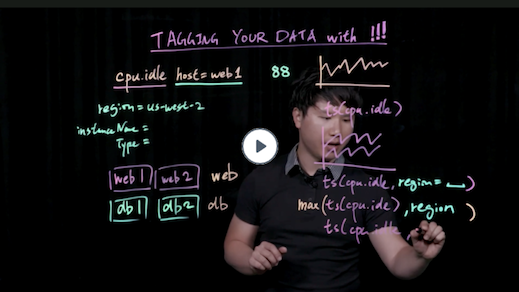 training) to several dashboards and how the tag can be used for filtering. He then uses additional tags in a hierarchy of tags (e.g. training.attendee and training.trainer) to support more fine-grained filtering using tag paths. Tag paths are available for dashboards, alerts, and events. Finally, for sources, Jason shows you can add source tags and filter directly from a query. By default, data include the metric name and the source. Cloud integrations include additional dimensions such as the AWS region, as point tags. You can add point tags to any data source from the UI or the API. Source tags are different. They allow you to group machines, for example, into db machines and web machines. You can then customize your queries to pull out just the data you need.